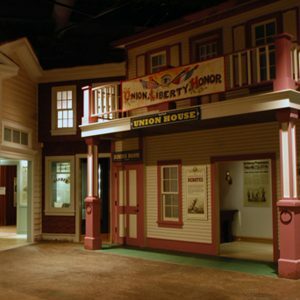 The Fiery Trial tells the personal stories of the men and women of the Upper Middle West – specifically Illinois, Wisconsin, Iowa, Minnesota, Indiana, Ohio, and Michigan. 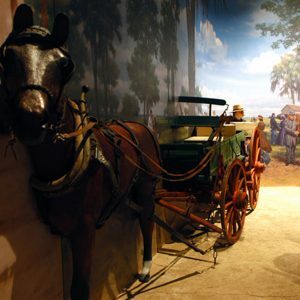 Through state-of-the-art museum technology, life-size dioramas, and interactive engaging exhibits, visitors travel back in history to the social, political, and economic influences that contributed to the Civil War. 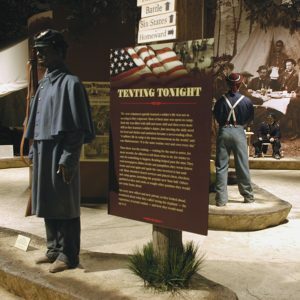 From the home front, to the railroad and waterways, to the battlefront and back home again, the Civil War is seen through the eyes of soldiers, nurses, spouses, children, clergymen, slaves, tradesmen, and the others who lived it. Experience the incredible logistics and resources that were required to mount the war effort, and the deep emotions that tore families apart. Medical care for Civil War soldiers in the field was extremely difficult. Seeing the Elephant is the term Civil War soldiers used to describe the first experience with combat. This new, high-tech digital movie experience in The Fiery Trial exhibit gives visitors a glimpse at “the Elephant.” One of just a handful of venues nationwide using 360° movie technology, this 10-minute film incorporates visual and sound effects as well as ground motion to enhance viewers’ movie experience. The story follows three characters: a young man seeking adventure, a patriotic family man, and an abolitionist – from enlistment to their first taste of combat. All three face battle together and ultimately deal with the consequences of war. Mr. Bill Kurtis narrates the film. 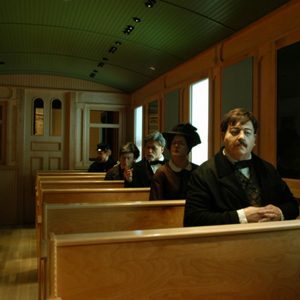 The 10-minute film plays on the hour in The Fiery Trial gallery. Admission fees apply. 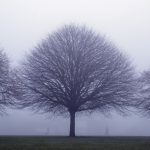 Trace the roots of three American families and how they impacted history in ways large and small. Discover how family genealogy and heirlooms come into museum collections, and the important role they play in understanding our shared heritage. 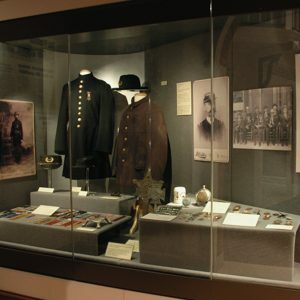 The Civil War Museum is proud to honor all US soldiers and veterans. Reflective of the theme, “Solidarity of Soldiers,” this gallery depicts Civil War soldiers huddled around a campfire under a twilight sky. Surrounding them are life-size soldiers from the Revolutionary War to present day conflicts. These soldiers all have a common bond — the waiting, the anxiety and the camaraderie shared in those quiet moments between battles. They share a common sense of duty, patriotism and honor, no matter where or when they serve or have served our nation. Around the gallery perimeter are displays of artifacts and memorabilia from each war. The Veterans Terrace on the exterior of the Museum surrounds the gallery. The bricks in the terrace honor veterans of all wars.